Glaucoma is best defined as death of the optic nerve head (ONH) or more technically, progressive optic neuropathy. The optic nerve is the nerve that travels into the back of the eye and goes across the retinal surface. The ONH allows the signals from the retina to be taken back to the brain. There are many types of Glaucoma and are classified depending on whether the anterior chamber angle is open or closed. 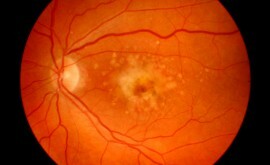 Glaucoma can occur on it’s own (primary) or can occur as a result of another ocular or systemic condition (secondary). 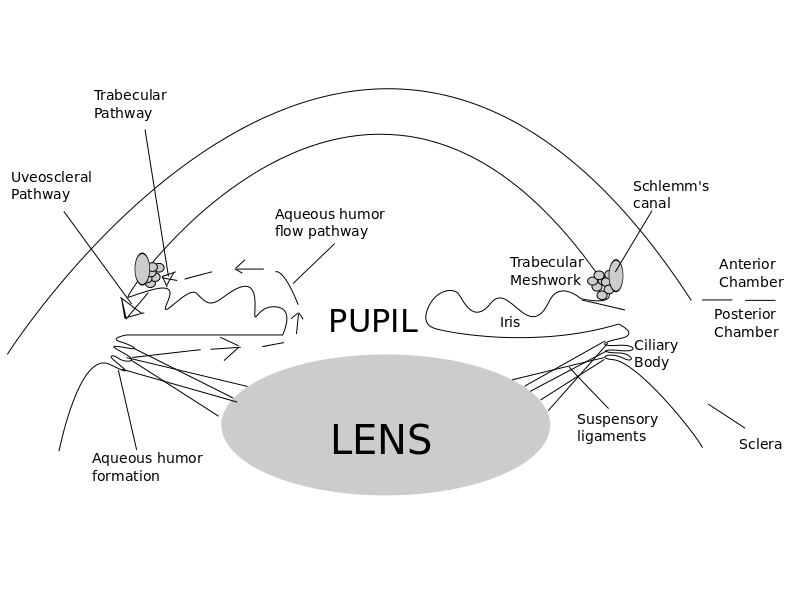 To understand the different types of Glaucoma we must know the aqueous pathway. Aqueous is a liquid that supports and provides nutrition for the eye (especially the lens and cornea). 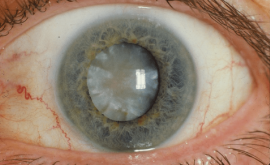 Aqueous also forms the anterior chamber. Aqueous is produced in the ciliary body behind the Iris. 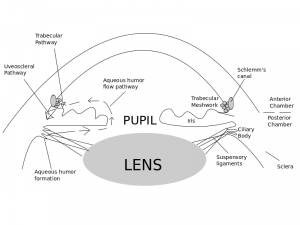 This liquid then travels in the posterior chamber, through the pupil and then spreads out in the anterior chamber. 90% of this fluid then drains back into the circulation of the eye through the trabecular meshwork (which acts as a sieve/filter) and then the canal of schlemm (which is like a small drain). The other 10% exits the eye via the venous circulation of the ciliary body, choroid and sclera. A tiny amount also drains through the Iris. This normally occurs when there is a dysfunction of the trabecular meshwork. You can use contact (applanation) or non contact (non applanation) technique. Applanation is considered to be the most accurate. Methods include Goldman (gold standard) or Icare (also very good). There are other methods such as the tonopen. When examining the ONH try and be systematic, The above list is the order in which I examine and assess the ONH. It is possible to measure the ONH size using the slit lamp and a condensing (volk) lens. The slit beam height can be adjusted when viewing the fundus through a volk lens. A graticule gives the size in mm. An adjustment must then be made depending on which volk lens was used. Cup to disc ratio is important as a large cup can be a sign of Glaucoma. However, many normal eyes have large cups (physiological cupping) and careful examination and consideration of all findings need to be done prior to referral. Βeta zone (β PPA) – pale zone around the peripapillary scleral ring and is characterized by visible sclera and large choroidal blood vessels. PPA can be a sign of damage to the ONH. Normally, when there are larger zones of both alpha and beta PPA with beta PPA being present more frequently. 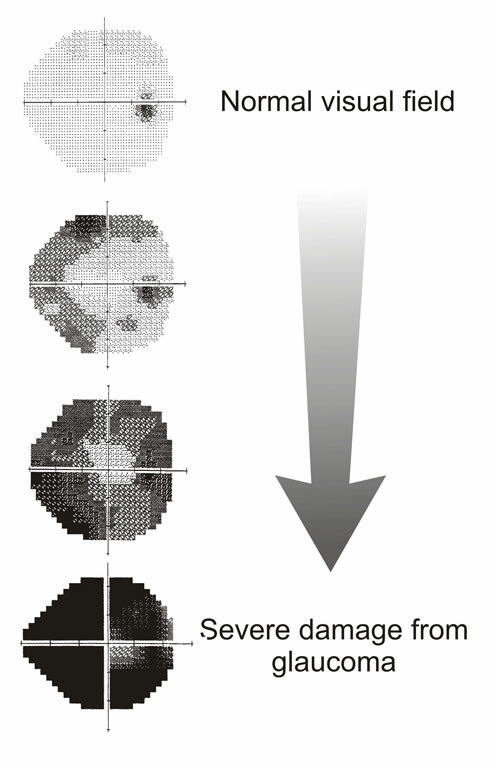 There is also evidence to suggest that the area with greatest PPA correlates to the area of glaucomatous ONH damage. 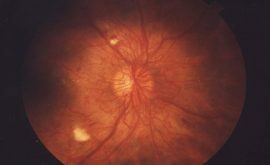 Change in PPA does not appear to occur in non-glaucomatous optic neuropathies. The neuroretinal rim (NRR) is the nerve tissue between the disc margin and the outer edge of the cup. When there is damage to the ONH, initial changes may be to the NRR. We commonly assess the rim using the ISNT rule. This is where the inferior rim is thickest, superior next thickest, nasal next thickest and temporal thinnest. If this rule is broken, the optic nerve may be suspicious. As previously mentioned, new guidelines have mentioned that both the NRR and rim/disc ratio need to be considered. Bayonetting – Vessels that move nasally across the cup base can indicate degrees of glaucomatous NRR loss that has resulted in the remaining NRR being undercut by the pathological excavation. Because these blood vessels travel up the temporal cup face, they will disappear from view when the NRR becomes severely undermined, producing a mismatch between their position at the cup base and on the remaining NRR. This appearance is descriptively termed “bayonet sign” due to characteristic misaligned appearance, comparable to a bayonet fixing upon a rifle. Nasalisation of blood vessels – Physiologically the central retinal artery and vein move through the lamina cribrosa at a position close the disc centre, the central retinal artery usually being more nasal than the vein. Both make a sub division into superior and inferior branch vessels soon after the point at which they are first visible. In the majority of normal eyes, these branch vessels move up the superior and inferior aspects of the nasal cup face towards the retinal plane. More nasal location of the larger branch vessels can be seen as the cup expands pathologically in GON as supportive nasal NRR becomes reduced in breadth. The lamina cribosa is visible when the disc is deep. Look for changes in the pores of the lamina cribosa. If they are round, they are normal, slightly oval may indicate changes and slit like is suspicious. The retinal nerve fibre layer (RNFL) is a layer of striations (fibre bundles) that run from the optic nerve towards the periphery. The striations look like silver/white threads and are best viewed with a bright, red-free light (green filter). It is easier to see in eyes with heavily pigmented retinal pigment epithelium (RPE) and choroid and may be very hard to see in eyes with blonde fundii. The RNFL is most visible within 2 disc diameters (DD) of the ONH and is brightest infero and supero-temporally, where the fibre bundles are most dense. Age and media opacities also make it harder to see. We need to look for changes in this RNFL. The changes can be focal, localized or diffuse. If clearly seen, it can be a significant sign of glaucomatous optic nerve head changes. If a correlation is made with a visual field defect it is even more valuable. Slit, or wedge shaped defects which are within 2 DD of the disc margin and wider than retinal vessels. Glaucoma causes visual defects of particular patterns. Examples include an enlarged blind spot, nasal step and arcuate defect. To measure the corneal thickness, an instrument called a Pachymeter is used. This device uses ultrasound to measure how thick the cornea is. Patients who have thinner than average corneas have artificially lower IOP readings and patients who have thicker corneas have artificially higher IOP readings. It is important to check this and adjust IOP readings accordingly. There is some evidence that suggests patients with thin corneas may increase their chances of having Glaucoma. 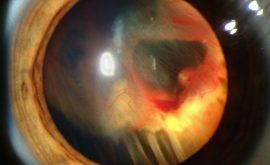 This type of Glaucoma occurs due to closure or obstruction of the anterior chamber angle. In primary angle closure the mechanism as to why this closure occurs is poorly understood but what is known is that there is a shift of pressure where the posterior chamber pressure exceeds that of the anterior chamber due to the pupil not allowing the aqueous to sufficiently enter the anterior chamber (pupillary block). As a result, the iris and lens move forward and tilt up, closing the angle. This angle closure causes the pressure in the eye to increase very fast and can severely damage the ONH if not treated quickly. Gross test using pen light – shine a pen light side on across cornea. The whole iris should light up, if there are any areas of shadowing – this may indicate a shallow angle. It’s worth mentioning that there are many sub groups of CAG. These include intermittent (or subacute), acute, post-congestive and chronic angle closure. intermittent/sub acute – CAG may be due to pupil dilation where the a/c angle gets crowded when the iris dilates. This may occur in a dark room when watching T.V. When the pupil then constricts, the pupillary body is spontaneously relieved, re opening the angle and lowering the IOP. Acute – this is a sight threatening emergency. The a/c angle is completely blocked and the patient presents with a red, painful eye. They may feel nauseous and the pupil will be mid dilated. The patient will complain about halos around lights and the cornea will appear hazy. post congestive angle closure – this happens after an acute attack and is due to associated trabecular or ciliary body damage post attack/treatment. Chronic angle closure – This occurs when the angle gradually closes over time due to anteriorly located ciliary processes. It can also be caused as a result of many intermittent attacks or if the patient has POAG in conjunction with narrow angles and has been taking miotic drops for a sustained period of time. In depth detail of these subsections are outwith the scope of this article. The goal is to either decrease aqueous production, increase aqueous outflow or both. This is not always dependent on IOP. Normally we are advised to refer if 2 out of the 3 possible findings explained about are out with normal. Intraocular pressure >25 mm Hg may be considered for referral to secondary-eye-care services irrespective of central corneal thickness. Ocular hypertension with intraocular pressure <26 mm Hg and central corneal thickness <555 micrometers should be referred to secondary-eye-care services if they are aged ≤65. Note – Patients who have ocular hypertension with intraocular pressure <26 mm Hg and central corneal thickness ≥555 micrometers may be monitored in the community.